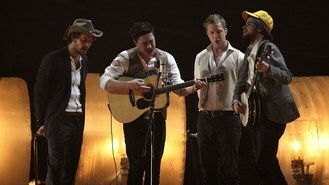 The awards celebrated the diversity of music as Mumford, Kanye West, Jay-Z, Frank Ocean, Dan Auerbach of The Black Keys and pop band fun. topped the nominations list. Auerbach received five nominations as a member of the Keys and is also up for producer of the year. Mumford & Sons, who made an auspicious debut in front of an international audience during last year's Grammys, is up for album of the year for Babel. The rockers little resemble any of the other acts at the top of the list. The top nominations for Jay-Z and West is a familiar refrain; each has routinely been at or near the top of the nominations list for the last few years. Indie pop band fun., a featured performer during the show, shown live from Nashville, Tennessee's Bridgestone Arena, rode the success of its anthemic hit We Are Young, featuring Janelle Monae, to sweep of the major categories, earning nods for best new artist, song and record for We Are Young and album of the year for Some Nights. The band's producer Jeff Bhasker is up for four nominations. "When you call your band fun. with a period at the end of the sentence, you set a very high standard for yourself and for fun itself," Taylor Swift, the concert's co-host, said. R&B singer Ocean received nominations for best new artist, record for Thinkin Bout You and album of the year for channel ORANGE. Miguel, who helped Ocean shake up the R&B world this year, and jazz great Chick Correa join the Keys with five nominations apiece. Nas and recording engineer Bob Ludwig join Bhasker at four apiece. The 55th annual Grammy Awards will be held on February 10 in Los Angeles. Trophies will be handed out in 81 categories.